Last year was a success but this year it needs to be even bigger! Our goal is to raise $10,000 for the Leukemia/Lymphoma Society This year we have decided to have a competition between Sycamore and Mason to see who will sell more t-shirts! SO WHICH SCHOOL WILL IT BE? T-shirts will be sold for $10. Students wearing the t-shirt to the game will get free admission. Adults wearing the t-shirt will get in for $3, without t-shirt regular $6 admission will apply. Sycamore and Mason High School will be selling t-shirts during lunch on January 28th and 29th and February 1st and 2nd. Whatever t-shirts are left, will be sold at the door. There will be competitions at halftime- Sycamore vs Mason! There will also be items raffled off throughout the game. Play by play, we are closer to a CURE! Go Mason. The shirts are bright and look awesome. If you have not bought one, you are missing out! 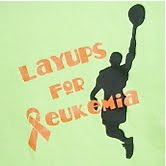 Praying for a cure and believing the research is helping tremendously. So cool!!! I wish I could be there for you Liz.. Always, you are in my heart and thoughts.